Variable malossi multivar 2000 mhr new. For Yamaha scooter t-max 530 / dx / sx 2017. 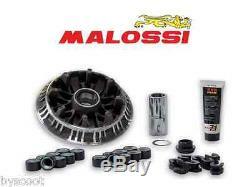 The malossi team worked to improve later a product "must\-max! To renew the transmission system and exploit the exceptional technical characteristics the drive has been perfected: so it was born multivar mhr. This new drive is the evolution of previous generations, born from the multi-year experience gained on the circuits and the cad-cam technology available today, and it allows to reach performances at the highest levels. The exchange curve shows that the work of the technicians has been focused on the subsequent enlargement of the operating range of the drive, in particular the short speed, gaining even more acceleration and recovery as well as improving the exchange rate linearity. , keeping almost unchanged the engine speed during the entire phase of the drive. We did better: we subsequently reduced the tolerances between the hub and the bushing and we reduced the roughness to a minimum to obtain a truly incomparable variator! This variator coupled with the exhaust malossi allows a performance rendering higher than the assembly variator malossi and pot akrapovic /! New, sold in original packaging. In stock - shipping within 24 hours. Yamaha t max 530 / sx / dx 2017. Range of exchange later enlarged (especially the short speed). Currency linearity improved throughout the phase. Ramp of excursion of the modified rollers in order to agree a better linear operation to maintain the engine speed at the maximum power. Rectified chrome cemented steel hub. New monolithic rolls made of even more efficient materials. Supplied with two different sets of rollers and two shims to change the speed of the curve of your vehicle by adjusting velocity and acceleration to perfection. The item "multivar variator mhr malossi yamaha t max 530 tmax dx sx 2017 new 5117744" is on sale since Thursday, May 18, 2017.